With over 10 years experience of designing websites for companies in the Brighton area as well all over the South East and across the UK, we have a great track record. We focus on building great websites for smaller companies at low prices. Our services include graphic design, logo design, website design, search engine optimisation (SEO), print deliverables, social media. Web design is constantly moving forward and it is important to keep your website up to date with current technology. We build web sites that respond to the particular device that is being used to view it. 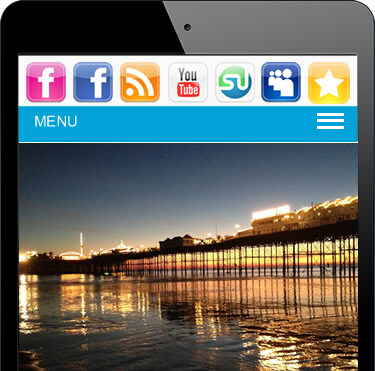 This means that your web site will look just as good on a smartphone or tablet as it does on an desktop monitor. If you are a Brighton based company looking for cost effective web design from a local Brighton or Hove based web designer, call our Brighton office for a no obligation quote or contact us with your enquiry..
We build websites that not only look great, but work for you and your business. We focus on responsive web design which means that your website will display perfectly on mobiles and tablets as well as desktops and laptops. We are based in Brighton and have a large portfolio of clients in the Brighton and Eastbourne area but we also have clients across the UK and internationally. With over 10 yrs of web design skills behind us we have a wealth of experience in building websites for a wide range of Brighton based companies and businesses. We also create graphics and logos which can be used across various mediums from screens to print, including business cards, flyers, and letterheads. We can provide a 'corporate' look for your company which includes logos, fonts and colour schemes. Search Engine Optimisation (SEO) is the process of promoting a website or webpage to affect it's position in 'natural' or 'organic' search engine results. It is generally accepted that the higher a web page is ranked on the search results, the more visitors it will receive. The success of your website can often depend on it's position or ranking. We have a long track record of producing excellent results and high rankings for our clients. SEO is also the most cost effective way of advertising your business. Ads generally don't work. SEO does!